Week 43 – Things are always working out for me. 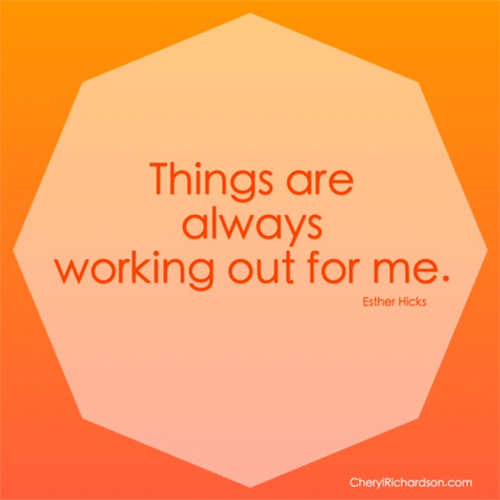 The first time I heard the author Esther Hicks tell an audience about the importance of using this affirmation to stay in the flow of life, I wrote it down and decided to use it myself. Then, I shared it with Michael and a few close friends knowing that the more I spoke about it, the quicker it would get installed in my brain. Sure enough, within no time, I began to see evidence that the affirmation was working. For example, I was invited to an exciting event in Los Angeles at the exact same time I’d scheduled an important appointment. When I called to see if I could reschedule (something that’s typically very difficult to do) I was told there’d been a cancellation and they could fit me in a week earlier. I hung up the phone and thought, Look at that, things are always working out for me. I also shared this affirmation with a good friend who was visiting from Europe and she adopted it for herself. While here, she needed to find a magazine for work that she could only get in the states. We looked everywhere, to no avail, only to find it sitting on the counter at a clothing store where we were shopping one afternoon. When the employee heard her mention that she’d been trying to find this magazine, he handed it to her and told her to take it home. I’ve been so amazed at how this affirmation works that I wanted to share it with you so you can use it, too. It’s a comforting, powerful message. Give it a couple of weeks and I have no doubt you’ll be pleasantly surprised by what happens. The right people will come along to help. I’m blown away by the creativity of people. Check out this fun video, here. Thanks, Kelly!